Oops - we don't appear to have a video for the ScanJet 5590. 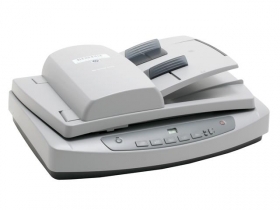 High speed, unattended document scanning with duplex automatic document feeder (ADF). Get the job done quickly with scan-to-PDF simplicity and bundled NewSoft Presto! PageManager document management software. ISIS compliance included. The HP Scanjet 5590 scanner is designed for home office/small office users who want to digitise multi-page paper documents. Key requirements are fast, automatic processing of two-sided documents and the versatility to scan transparent materials. Get more done with automatic two-sided, multi-page scanning. Load up to 50 pages in automatic document feeder (ADF) and set them scanning. Automatic processing of double-sided documents for streamlined workflow. High unattendedness – digitise multi-page documents while you get on with more profitable business. Be productive from day one – easy, reliable operation with intuitive controls. OCR software converts printed paperwork into editable documents. Do the job faster and return to work sooner with high speed document processing. Scan up to 8 pages per minute* (or 4 images per minute) using the duplex ADF. No waiting around – view preview scans in about seven seconds. Store, organise and access digitised documents using bundled NewSoft Presto! PageManager software. Rapid access to all key tools via front panel one-touch buttons – including scan-to-PDF. One-touch scan-to-email automatically attaches your scan to an email. 'Copy centre' productivity enables quick and easy desktop copying through your printer. Digitise images from slides and negatives with included transparent materials adapter (TMA). Complete out-of-the-box scanning solution – capture high quality scans from 35 mm slides and negatives. Easy plug-in connection – no need to remove the standard scanner lid. TMA can also be used as a light box for viewing/selecting slides. Scan multiple images at once – TMA holds 3 x 35 mm mounted slides or strip of 4 negatives. Scan at up to 2400 x 2400 dpi resolution, 48-bit colour. Included standalone TWAIN driver allows software installation flexibility.